Yep, it’s way past my birthday, and well I decided to get myself a nifty little Palm Wireless Keyboard. I had thought about getting a PDA keyboard for awhile. As any PDA user would know, keying in data especially if it is a lot of data using the Graffiti is such a pain. At RM220 it is not cheap! But looking around all the PDA shops around, this is still the cheapest. The technology is a bit old. It is using infra red (IR) for communicating with the Palm device instead of the newer Blue Tooth (BT). Still cheaper though, since blue tooth enabled keyboard cost about RM400+! I think the power drain on my Palm Tungsten T3 using IR is not as bad as using BT. But the smaller capacity of the T|T3 battery still means that the power gets used up quite a fair bit fast! Argh, if only the Palm designers put a more powerful battery! Seems the new Tungsten T|X has a bigger battery capacity and thus has longer usage time! Well, I have too many accessories still using the older connection that it would be such a loss to upgrade to a T|X. Guess I have to live with this T|T3 for now. With the wireless keyboard, now I don’t have to consider to get a laptop, which was what I had been toying in my mind. RM220 wireless keyboard vs RM3000 laptop is quite a big gap! So why not try to make full use of my PDA? After buying the wireless keyboard, still have yet to fully utilized it though. Right now it is more like playing around with it and has not gotten around using it seriously. My initial idea was using it to type in articles for my website or even for my various blogs. I was wondering if it would work with my Palm Centro and decided to test it out my Palm Wireless Keyboard with. And hey! It works. However the infra-red sensor for the Centro was at the side, so it would require tilting my Palm Centro mobile phone to tap out my messages. It works great and I could write messages really ultra fast! My wife did complaint to me why my text messages was so long! Well I guess I went overboard tip-tapping on the keyboard. It was way much easier to type that the tiny build in Centro keyboard. 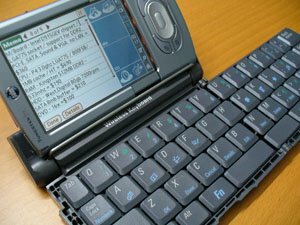 However, it takes a little extra time to set up, so I’m unlikely to carry the wireless keyboard around together with my mobile Palm Centro. Makes no sense. Although my plan to carry around the wireless keyboard and a Palm like Tungsten T3 to do my work was just a concept idea that never really took off. It would fill my time with productivity but mixing in some extra work to fill in the time while my wife went shopping didn’t seem like such a great idea. Oh, well, with the build in keyboard in my mobile phone, I could still tap out some quick short blogs. For extended article write ups, I would still prefer to bring along say my Netbook (which was an added weight, so it didn’t work out either) or stay at home surrounded with all my research material and the comfort of a proper work desk, kitchen nearby to scrounge for food and drinks and toilet breaks which I would say is far more convenient then say hanging out in Starbucks with all my PC gadget equipment. Category: Computer Devices, Personal. Follow this entry's RSS 2.0 feed. Skip to the end and leave a response.